What do you get when you take four historic Georgian houses and mesh them together? 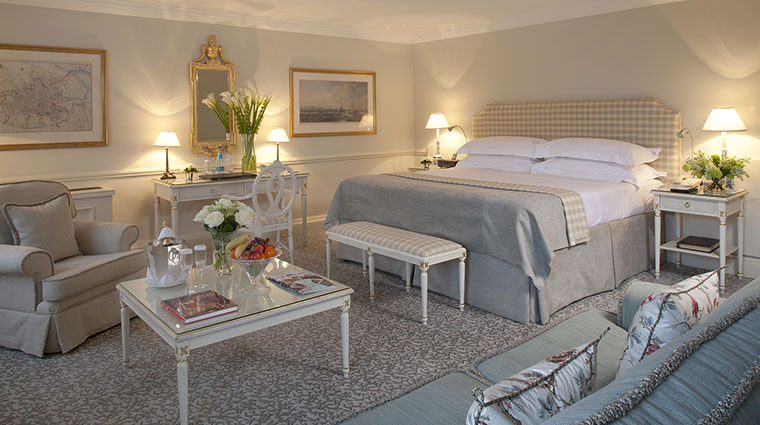 In the case of The Merrion in Dublin, you get a stunning 18th-century property that hits all the right buttons when it comes to classic style, fine service and an easy elegance, right in city center. Because the property used to be a series of homes, the interior speaks to this by maintaining a comfortable, welcoming feeling. Of course, numerous plush couches, roaring fireplaces and not-too-big common spaces help with this vibe as well. The walls are hung with art, the tables laden with fresh-cut flowers, and you can get superb food and drink in all sorts of unexpected places throughout the property. 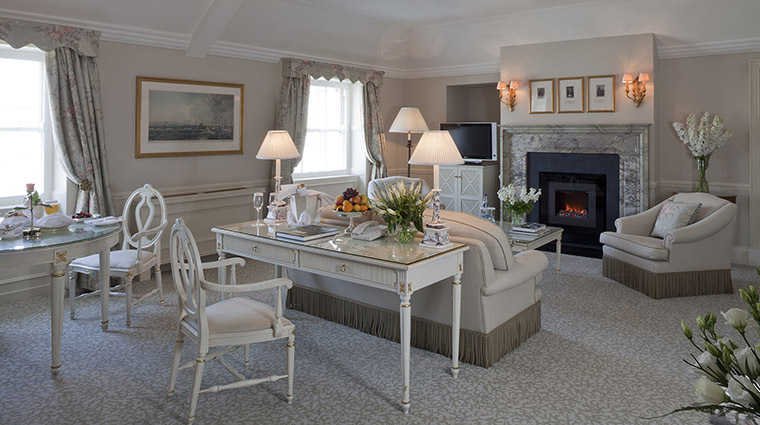 Given the luxury hotel manages to strike such a balance of comforting, high-end service and dedication to Ireland, it's easy to fall in love with Dublin within the Merrion's walls. 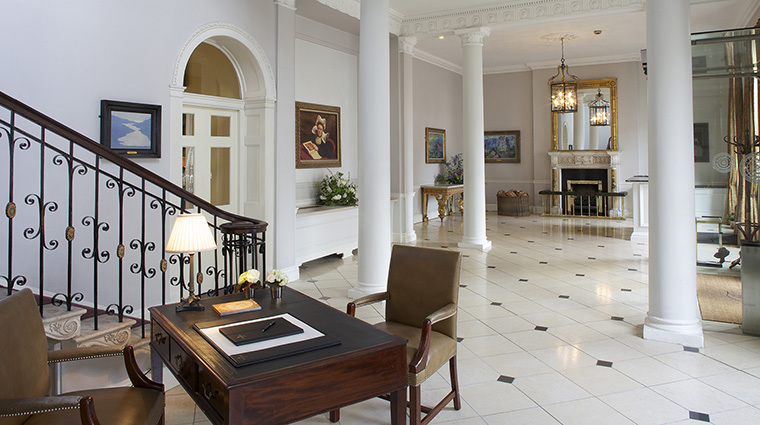 Even though the Dublin hotel speaks the language of refinement and superb service well, it might best be known for its unequaled collection of 19th- and 20th-century European art, with a focus on Irish artists. While it may look like your living quarters came straight out of the 18th century, the amenities are all modern. When not lounging in the comfort of your suite, take advantage of the downstairs gym, spa and pool. The latter looks like a bath you might have encountered in ancient Rome, and the cheery murals along the wall make up for the pool's secluded underground location. The property's two lavish gardens were designed by notable Irish landscape artist Jim Reynolds. Each space re-creates the feel of an 18th-century garden and features box hedges, water fountains and whispery pathways with sculptures tucked in between. Guests are always left impressed by the striking full-sized figure of writer James Joyce, part of an artwork that weaves bits of the author's classic tome Ulysses around the base. You can take your own tour with the handy collection catalog or book a private guide from the National Gallery of Ireland, which is conveniently located across the street. With 90 works hung around the public spaces, see pieces by notable names such as Robert Ballagh, John Boyd, William Scott and Roderic O'Conor, a favorite of hotel owners Lochlann and Brenda Quinn, who have 12 of his paintings. Stay in either the garden wing or the main house, which is located on the second floor of the first building and boasts views of either the garden or the grand government buildings across the street. 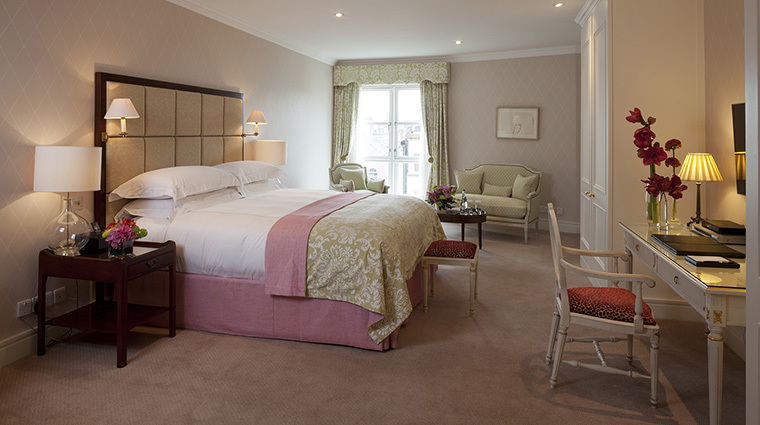 The Merrion offers 142 rooms, each decked out in Irish Georgian style. Like most spaces from this era, the walls boast a simple color, letting the vintage patterns found on the sofa, chairs and beds shine brightest. Sleep peacefully with 400-thread-count Egyptian cotton bed linens, a King Koil Executive Club 6 bed and fully stocked mini bar. There’s also a grand marble bathroom complete with a bidet, huge bathtub and Asprey toiletries. 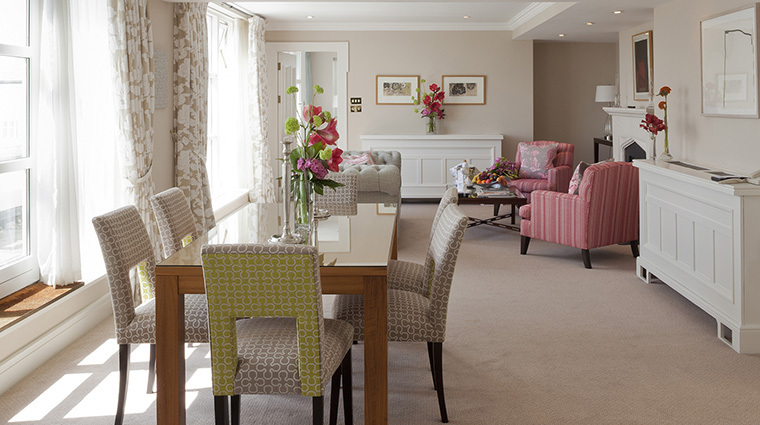 Nineteen of the units are one- or two-bedroom suites that feature a separate sitting room and, in some cases, a dining room. Restaurant Patrick Guilbaud is a fan favorite not only because of its excellent service, but also the extravagant meals. Staff delivers plates of blue-lobster ravioli, king crab and cucumber maki, and a filet of Irish beef, each bite proves more delectable then the next.The wine program also sings and should not be passed over. Cellar Bar is nestled in the bowels of the hotel. Coolly sip a cocktail or order a pint of Guinness, all while marveling at the venue's 18th-century wine vaults, which were part of the original main house. When you are ready to come back into the light, high tea in the drawing room pays homage to the venue's art scene. Pastry chef Paul Kelly's art tea, is a multi-tiered extravaganza of tiny gourmet sandwiches, pots of tea, delicate pastries, hearty scones with Irish clotted cream and the crowning jewel, the desserts themed after the hotel's works of art.